For anyone who has experienced the death of a loved one, you know the pain, the heartache, that accompanies that occurrence. Everyone walks their grief journey in a different way, although there ARE some similarities. Faith-filled people may realize that the loved one “has gone Home” while others may feel desolate and completely abandoned. 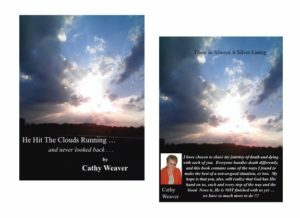 There is no right or wrong, for this topic, but when I wrote my second book, “He Hit The Clouds Running …… and never looked back …… ” I wanted it to serve as a platform for the subject of Death to be discussed. Sometimes Death is a taboo subject because of the pain, and sometimes family and friend drama, that is may cause. Death is a part of living and how you are ‘allowed’ to share that experience may make a profound difference in your ‘recovery’ time. The pain, the scar/s, the ache, may always be there but the ability to realize that you have survived may be just what the doctor ordered. As Ellen says at the close of each show, “Be Kind To One Another”.